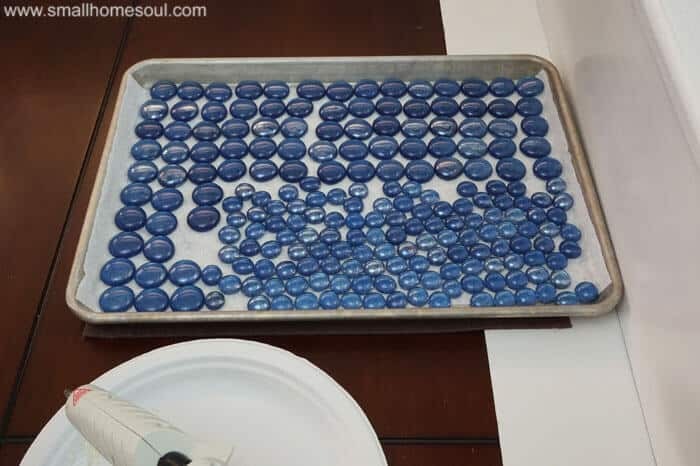 Dollar Store Glass Backsplash Tutorial - Girl, Just DIY! It’s the most frustrating when you spend hours and weeks working on a project and assessing all your hard work you realize there is no wow, awesome, love it, feeling. That’s what I was feeling as I was at the frantic end of my $100 Master Bathroom Makeover project. I had absolutely no idea what I would do to pull the entire bathroom together. I’d painted the TP cabinet white but it looked, well, meh. What to do, what to do? Then it hit me as I walked through the garage to the front yard. I would install a glass backsplash on the back of the TP cabinet. I sometimes do my best work with a looming deadline and thankfully this was one of those times. When a great idea strikes you just have to run with it. one of my links I may make a small commission. Have I mentioned that I am a saver of things? I’m not really a hoarder because hoarders save useless stuff like old newspapers, pieces of string (um, well ribbon and such doesn’t count as a horde), used matches, you get the picture. And I only save stuff I know I can/will use again. Haha, truth, even if my hubby would disagree. I dug out a bunch in different sizes and did a dry fit on the back of the open shelf to see if my plan would work. This also helped me figure out how many I’d need. It turned out to be 88 big and 88 small beads. Thankfully I had that and some extras left over just in case. I knew I needed to glam them up from plain so they would really pop. And I knew exactly what I was going to use and how I was going to do it. 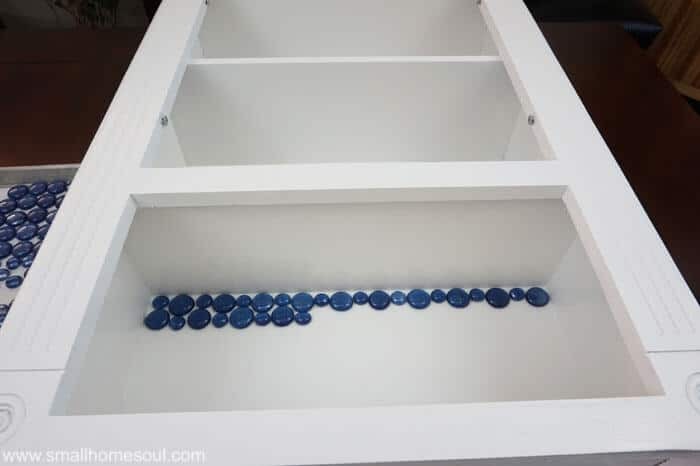 Since I already had my spray shelter in the front yard I just took my beads and a can of blue metallic spray paint and got to work painting the backs of the beads. I love metallic spray paint, I used it for the coolest effect on my bathroom light makeover. I put on a few coats of paint because I wanted the look to be rich and make sure it showed through the thick glass bead. After they were dry I cleaned up the edges that had a little bit of over spray that drifted between the beads. If you’re going to grout your backsplash you can skip this step. They are looking awesome already and I haven’t even started applying them. I practiced with a few extras on a paper plate so I was sure they wouldn’t pop off the cabinet wall. That would be a huge bummer. So you can see I got out my glue gun and got to work. The fit was almost perfect but these glass beads aren’t the same sizes. As I glued them in I had to make sure my spacing was good. It would stink if I got to the last bead in a row and ran out of room. I kept gluing large then small alternately until I got all of the rows finished. I love love love how it turned out! There are a few things I would do differently if I was to start over. I’ll tell you what that is in a second. 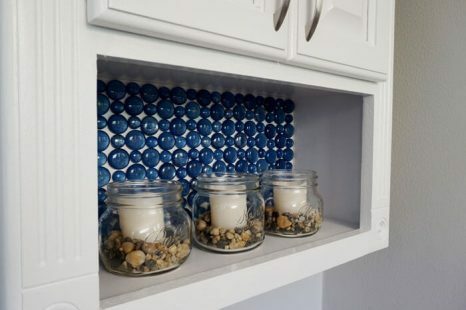 I love the pop of color from the blue in my new glass backsplash and the little mason jars with the faux flame candles! And the faux IKEA Plant in the white IKEA Kardemumma pot looks great on top. The thing I would do differently? I would start applying the glass beads from the bottom up. The upper edge of the glass backsplash isn’t usually visible which would hide the uneven edge of the final row. Regardless, I love my new glass backsplash so it’s a small detail I can overlook. I’m loving it! Those beads and the other changes I made in the our Bathroom give it a spa feel. What an inspirational blog! As you post new blogs, I will look into it for sure. Well, thanks for this wonderful thoughts. In need of a backsplash I decided to do this in my bathroom. I absolutely love the way it turned out. Hi Jan! Thanks for leaving a comment and question on this project. I haven’t installed this little backsplash anywhere else, just in the TP cabinet. If you want to do a similar project over your sink area I’d suggest using products specifically for wall tile and grouting between the glass to ensure it’s waterproof. 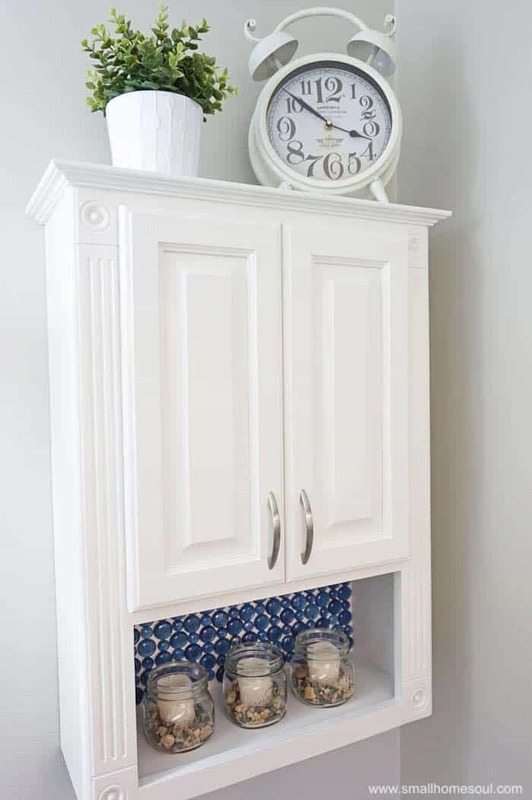 You can really customize these with any color you want for a beautiful and unique look in your kitchen or bath. LOVE your back splash!!! I’ve been playing around with the glass gems lately and I have problems getting the colors I want or need and have used several things that I’ve had on hand. I was wondering about the spray paint you use. 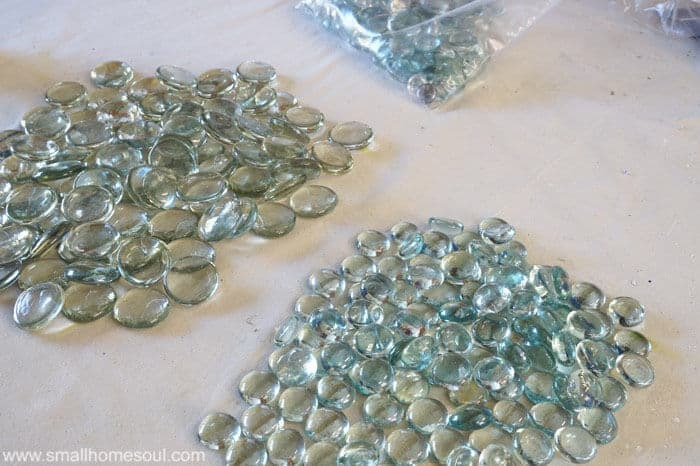 I make sun catchers using clear Elmer’s Glue and sometimes when I’m removing them from the mole the color comes off and I have to touch them up and I was wondering if what you used would do a better job. Since I’m making sun catchers I would want something that would allow the sun to come through some. Do you think this would work? My husband is going to kill me when I tell him what my next project is! I’ve got to find a place to use your idea! Thanks so much for sharing!!! Hi Karen, thanks for commenting. I love your sun catcher idea, I bet they are beautiful! I used spray paint on the backs of mine and while the can says they work on glass it is really opaque so you wouldn’t see any sun through it. If you use a metallic paint you’d get the sun glittering off the gems. Depending on what is holding them it’s possible that the paint might scrape off. 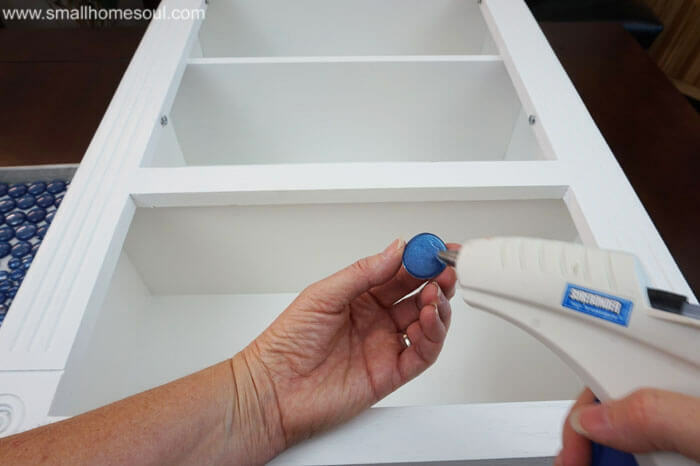 When I was testing mine on a paper plate before I committed to gluing them into the cabinet back, I pulled at them to see how firm they’d be attached. A few of them popped off with quite a bit of force and the paint stuck to the glue and not the glass. That could be because I used them straight out of the package and didn’t clean them with alcohol first. They’re stuck like crazy in the cabinet and I’m not worried they’ll pop off at all. If you want to do it around water consider using a mastic for tile and then grouting between them. Good luck, I’d love to see pictures when you’re done. Lovely! I pinned this for later. GREAT JOB!!! I love it!!! We are gonna try it. I would have never thought of that! But I absolutely love it! This is so creative and it came out BEAUTIFUL! I love the crisp contrast of Blue & White. Great Job! Thank you Beth! I do love the blue and white combo too. Apparently I’ve done it a lot and didn’t even realize it. Oh this is such a good idea!! Thanks for sharing at the Peaches+Salt Link party! 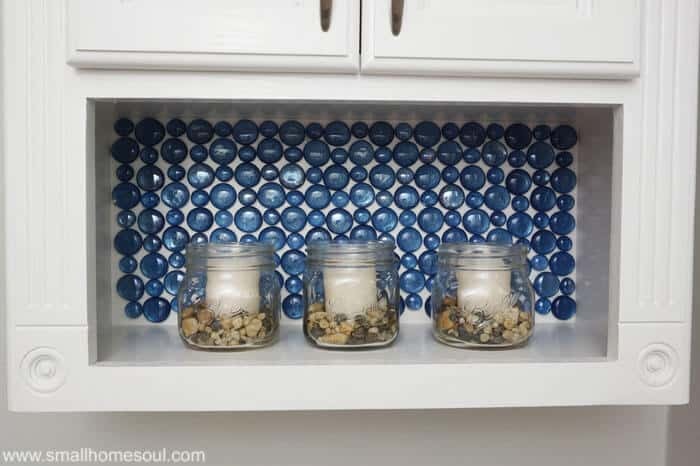 Your backsplash looks amazing! 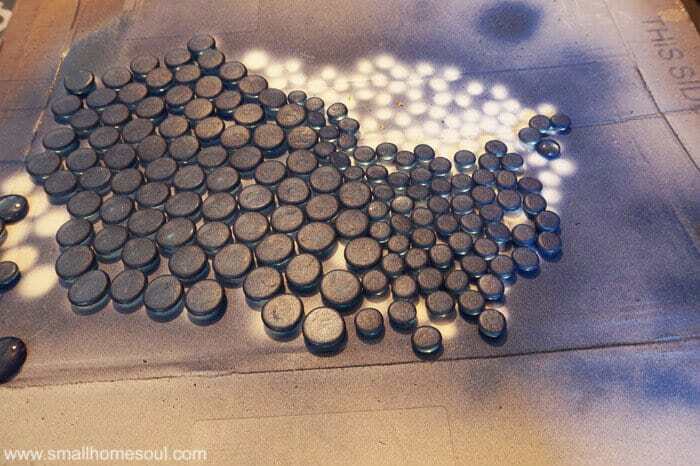 I never would’ve thought to spray paint them, but what a great idea! Love the pop of color that it adds to your shelf 🙂 Thanks for linking up with Creative Spark last week; I’m featuring your backsplash project this week. 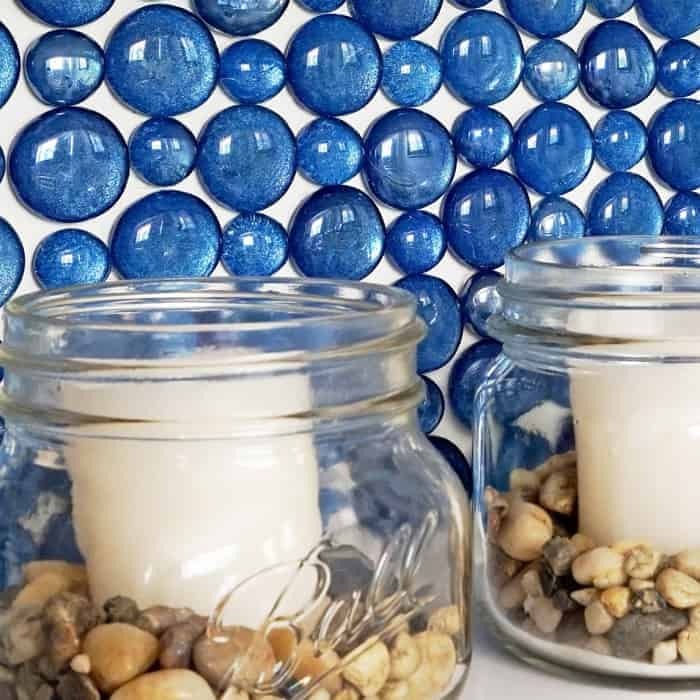 In love with this easy and creative backsplash! Thank you and thanks for visiting my project! 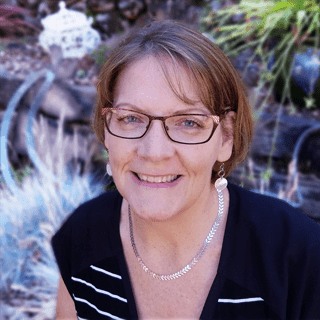 Thank you so much Christene, I hope I inspired your readers! Creative use of something you have for decorating! Decorating can get expensive. Thanks for sharing on Family Joy Blog Link-up. Please come back and join us again! Remember to leave your host a comment to increase the chance of being featured. This is beautiful. I would of never thought of doing this. Thanks for joining us at Family Joy Blog Link Up Party this week. Thank you Charlene, and thanks for the great link party! Super cute idea! You are so clever! Thank you Susie, I really love it! Wow! This backsplash is lovely, and you certainly aren’t afraid of big projects! Love it. Thank you Wendy, I was nervous because once that glue’s on there there’s no adjustments. You are so clever and creative! 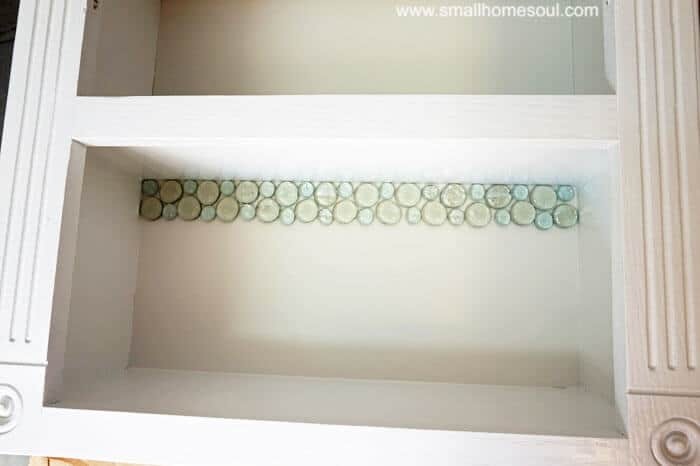 I love this idea of adding the glass pebbles as a “backsplash” to your cabinet and it is a great look in the bathroom! SO lovely! Thanks so much Katrin, that cabinet would have been so boring without the shimmery pops of color. Wow! this is such a great idea, Toni! So clever my friend! Thank you Kellie, I really love how it turned out! This idea is genius Toni! I was wondering how you got them to look blue!! So cool!! I love it!